Todd Haynes finally got to use a David Bowie song. Nearly two decades after the late icon denied the filmmaker’s request to license his music for Velvet Goldmine, Haynes’ bittersweet mash note to glam rock, Bowie’s breakthrough single, “Space Oddity,” haunts the soundtrack of Haynes’ new movie Wonderstruck. It’s the first hint the films share more than a director. On the surface, they couldn’t be more different. Released on just 85 screens in the fall of 1998, Goldmine is a thematically ambitious, structurally complex meditation on fandom and identity whose frank depiction of queer sexuality earned it an R rating. The film is prefaced by this disclaimer: “Although what you are about to see is a work of fiction, it should nevertheless be played at maximum volume,” a reference to a similar note on copies of Bowie’s Ziggy Stardust. Its fragmented narrative swirls around Brian Slade (Jonathan Rhys Meyers), a Bowie surrogate who disappears after faking his own onstage death. Wonderstruck, a largely silent adaptation of Brian Selznick’s bestselling 2011 children’s novel of the same name, is a family-friendly picture intended for wide release. Its relatively simple plot — adapted for the screen by Selznick himself — concerns a boy searching for a father he’s never met. And yet the film feels like a spiritual sequel to Goldmine. Wonderstruck’s hero is 12-year-old Ben (Oakes Fegley), a gentle, dreamy kid in rural Minnesota who has transformed his bedroom into a miniature museum of jarred and tagged specimens. The year is 1977. Ben’s beloved mother (Michelle Williams) has recently died in a car crash, he’s living with his aunt’s family and all he knows about his father is his first name and the address of the Manhattan bookstore where he once worked. In another freak accident, Ben is struck by lightning while trying to phone the shop during a storm. He wakes up in the hospital to the terrifying revelation that he’s lost his hearing. Still apparently in shock, he sneaks out of his bed, hops a bus to New York City and wanders into the American Museum of Natural History. There, he marvels at the elaborate dioramas and meets a much-needed friend: Jamie (Jaden Michael), a boy whose dad works in the museum. Interspersed with scenes whose gold-hued warmth Haynes and cinematographer Ed Lachman borrowed from ’70s New York films like The French Connection are several black-and-white sequences set 50 years earlier. Ben’s 1927 counterpart is Rose (Millicent Simmonds), a deaf preteen in Hoboken, New Jersey, who sobs alone at silent film screenings starring the glamorous Lillian Mayhew (Julianne Moore); she keeps a scrapbook of the actress’ clippings, too. Stifled by life with her overprotective father (James Urbaniak), she also escapes to the big city and ends up falling in love with the museum — a place where you don’t have to hear to appreciate beauty. A contemporary silent film is as much about sound as one focused on loud music and the people who make it. Outer space is the film’s central symbol. Lost in the universe, Ben and Rose look to the night sky for answers. As we learn in an early flashback, Ben’s mother once surprised him with a telescope. She loved “Space Oddity,” a fragment of juvenalia that presaged then-22-year-old Bowie’s career-long fixation on the cosmos, as well as glam rock’s embrace of science fiction. The Oscar Wilde aphorism “We are all in the gutter, but some of us are looking at the stars,” once adorned the wall of the mother’s room and now hangs over Ben’s bed. In the 1920s storyline’s most emotional scene, Rose writes the words “Where do I belong” on a piece of paper, then folds it into an origami boat and places it at the top of the museum’s Ahnighito meteorite. She eventually finds her answer at a school for the deaf. 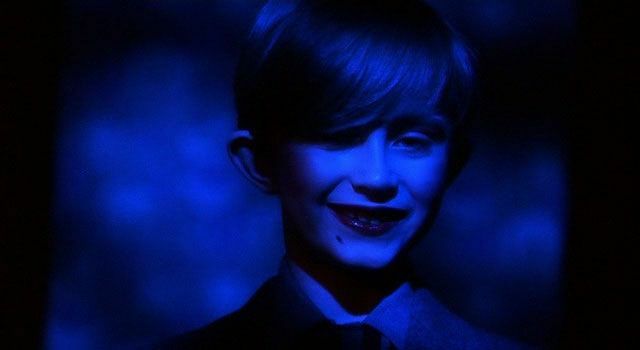 There are plenty of small, exhilarating links between Wonderstruck and Velvet Goldmine that viewers who love the latter will immediately recognize. Both movies toggle between two very different, visually distinct time periods and linger on images of shooting stars. Wilde appears in the earlier film, too, as a sort of patron saint of glam rock. Throughout Goldmine, his bon mots glide across the screen on title cards like the ones in Mayhew’s movies, intertitles that recall the words Wonderstruck’s deaf protagonists scribble in notebooks to communicate. Ben has the same floppy bangs as young Jack Fairy, Goldmine’s glam-rock patient zero. There’s something subtly queer about Ben and Jamie’s earnest friendship, which has a sort of rom-com arc to it. They delight in taking Polaroids of each other and quarrel like lovers. A contemporary silent film is as much about sound as one focused on loud music and the people who make it. The dearth of spoken dialogue in Wonderstruck only heightens the impact of its soundtrack. “Space Oddity” (which is also present in Selznick’s book, along with the Wilde quote) isn’t even the only aural allusion to glam. Hidden away in a secret wing of the museum, Jamie blasts The Sweet’s 1975 glitter-pop hit “Fox on the Run” so Ben can feel the speakers vibrate. There are moments when the background music in the 1977 story seems to echo the twinkling instrumental intro to Roxy Music’s “2HB” — perhaps the most important song in Goldmine. Carter Burwell composed the scores for both movies. Those little parallels draw out the most important connection between the two films: At their core, they’re both stories of lonely, young outsiders who travel to the city and find their people through the creative pursuits that have helped them survive their bleak childhoods. Brian Slade isn’t Goldmine’s real hero; it’s Arthur Stuart (Christian Bale), a suburban teenager whose obsession with Slade brings him to London, where he meets like-minded peers and experiments with his sexuality. In Wonderstruck, Ben is a budding curator and Rose seeks catharsis at the cinema. All of their journeys have similar trajectories, although this kids’ movie ultimately replaces its predecessor’s melancholy undertones with something more hopeful. In a recent interview with GQ’s Kristen Yoonsoo Kim, Haynes reflected that “the films that expanded my little mind when I was young were not fantasy films. They were about real people in real times and places.” For a generation of teenage outcasts who stumbled upon it at the video store or on cable, Velvet Goldmine was that film. Wonderstruck promises to catalyze the same epiphanies for a larger, younger audience that won’t have to look so hard to find it.